India opens its medal account in London 2012! Gagan Narang wins bronze in the 10m Air rifle event. He finished with an overall score of 701.1 just behind the Gold medalist Alin George Moldoveanu (702.1) and Silver medalist Niccolo (701.5). 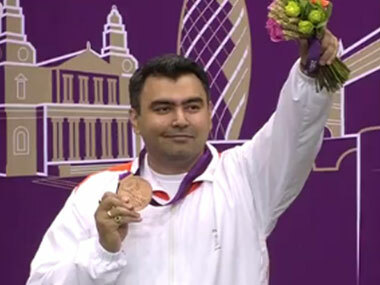 Gagan Narang WINS INDIA'S FIRST MEDAL WITH A BRONZE IN THE 10M AIR RIFLE EVENT. OLYMPIC KI SARI NEWS OR PURI JANKARI KE LIYE IS PAGE KO LIKE KARE.. Send in your wishes to congratulate him.